The first Sunday of Advent is November 29th and I really want to get a book in your hands before then. If I can ship to you from Grand Rapids this week, instead of waiting for books to arrive here in AZ just to put them back in the mail, you will get a book a lot faster. A bunch of the books are actually staying in Grand Rapids for family and friends, I would love to give those out in person. Plus, my family is in West Michigan and it is always nice to see them. Wrapped in Grace is a retelling of the Christmas story from a little bit of a new perspective, with daily readings and space to journal. It is designed to be read during the four weeks leading up to Christmas beginning on the 4th Sunday before Christmas. (This year, Advent begins on November 29th). I will post video readings here throughout the Advent season, and there will be space to connect and respond to the readings here if you would like to. Thanks for joining me as we celebrate the season of Jesus’ birth! I’d like to order 3 of your books. I don’t know if you remember me or not, but we attended SCF for 20plus years together and my son, Cody Jepsen went to school with your boys. Robin! I completely remember you! Whenever I glance at “Jepsen Rogers” on your facebook page, I think it says Jaesa Rogers! So fun that you live in Colorado! If you click on the Buy the Book link above, it should take you to a place where you can order books, but you have to scroll down on the page for the order process. If that doesn’t work though, I can send you the books and you can mail a check. Let me know! Hi Deana, I’m wondering if there is a place on the internet where we can view/read a few pages of your book? It does sound like a great book, but would like to read a preview if possible. Hi Kathy! 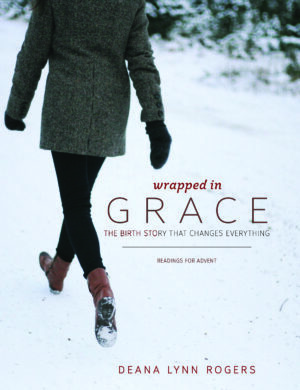 Yes – You can click on the Wrapped in Grace Preview link above. Scroll down on that page to a link to the first pages of the book, including the table of contents and the Week One, Day One reading. Deana, I would like to order 1 copy of “Wrapped in Grace”. Please email how to receive the book. Congrats, Pierre. Scratch last message, just ordered the book. We received your book from your relative, Scott Courey. It’s beautiful. I am refreshed in heart and soul with Week 1! I haven’t been successful opening your BUY THE BOOK page now, but will keep trying. If things aren’t working properly internet-wise, no bother, we understand. We can imagine the effort you have given–“not even close to a self-sufficient endeavor”, as you say. May God bless you with His rest for your soul and body. Janiece, Thank you for your kind message – I am so glad you are enjoying the book! When you click on the BUY THE BOOK page, try scrolling down – the top of each page is the same so sometimes it doesn’t seem like the page changes. I have to fix that! If it doesn’t work, and you would like extra copies, email me at deana@ancientnewstory.com and we can work it out. There are extra copies in GR that we can get to you quickly. Thank you so much Teena! It is such a gift for us to be a part of Redemption. It is so fun loving the story with you. I would love to order a book. Not sure how to get my info to you but my friend Cindy Lutz recommends you and as a librarian for a church, I am always on the lookout for books that bless and cause people to draw closer to God. So please let me know and I will be glad to send you my info. I also did not see a price. Thanks again. I am from West Michigan and so am excited to have a link to you as well. Hi Denise, I would love to make sure that you get a book. I am actually in West Michigan for a day and could Priority Mail you a book on Tuesday. When you click on the “Buy the Book” tab, make sure that you scroll down the page to add the book to your cart. If that doesn’t work, you can order through Amazon or email me at deana@ancientnewstory.com and we will work out the details. Thanks to Cindy for recommending the book!